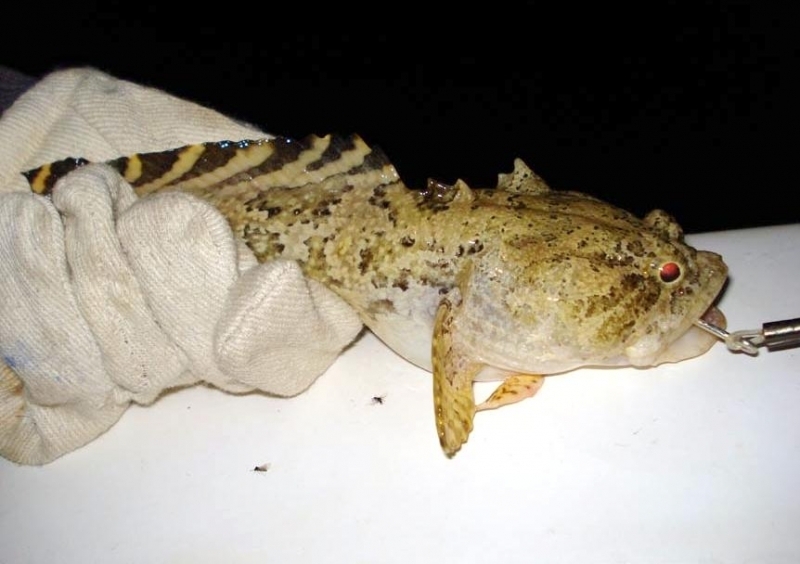 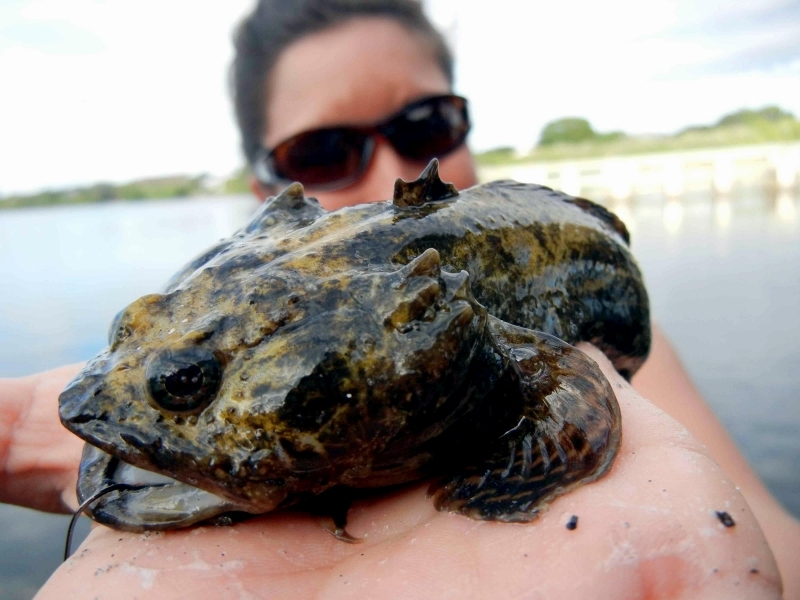 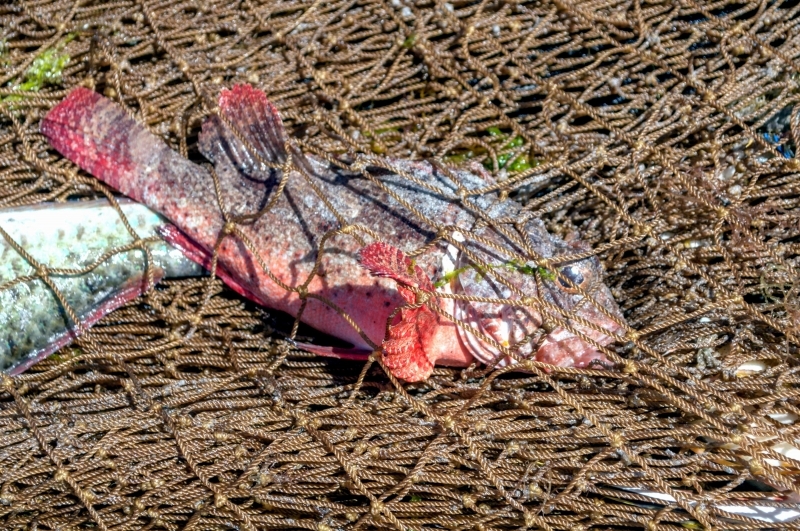 The Oyster Toadfish is an unusually shaped, large-headed fish that generally lives along oyster reefs and vegetated muddy bottoms. 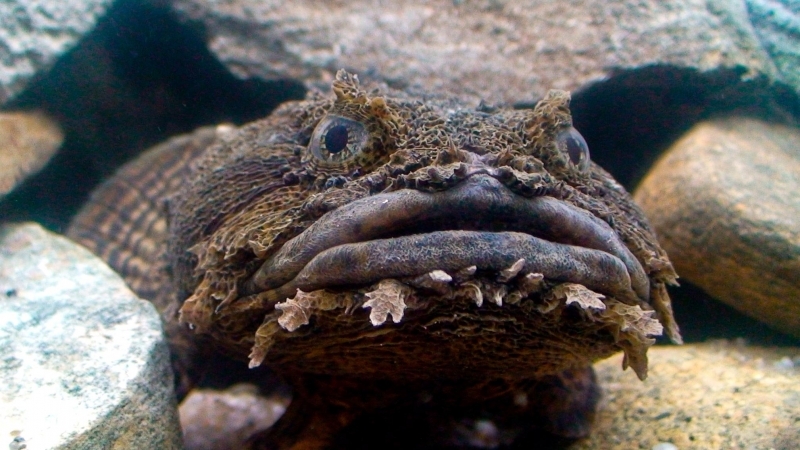 It has scaleless skin covered instead by thick mucous and sometimes warts, making it easy to understand why it earned the name. 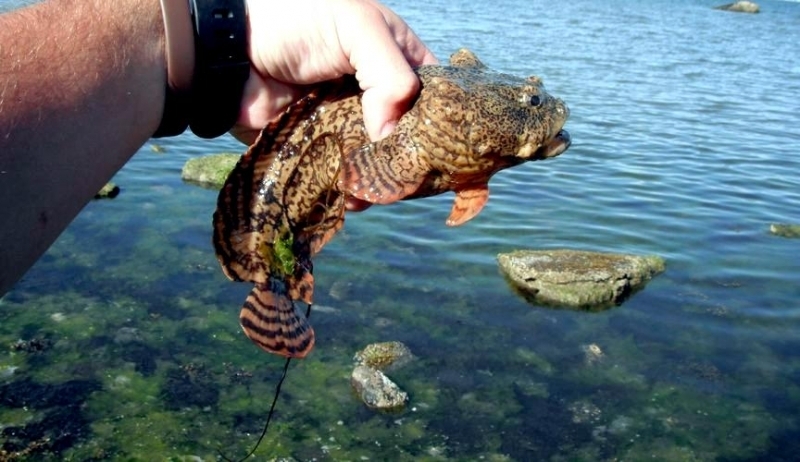 Out of water, this fish feels soft & squishy. 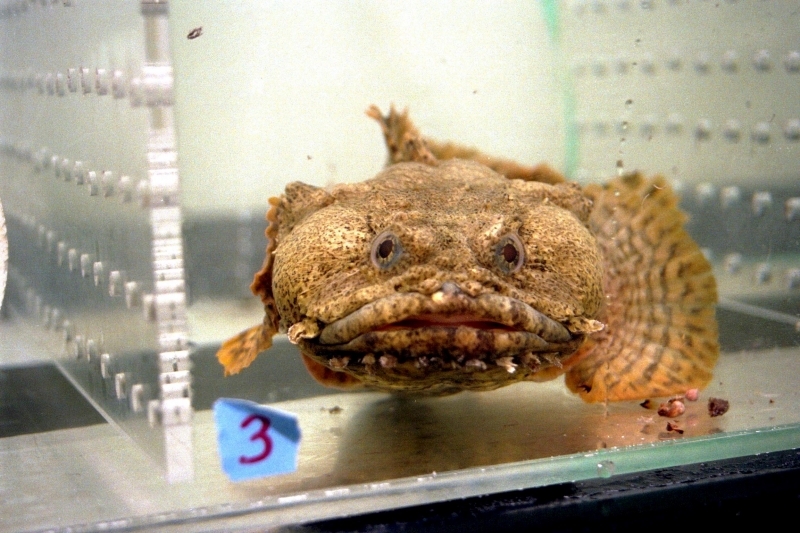 Oyster Toadfish have a tapering body with a plump belly and a large, flat head that tapers to a thin tail. 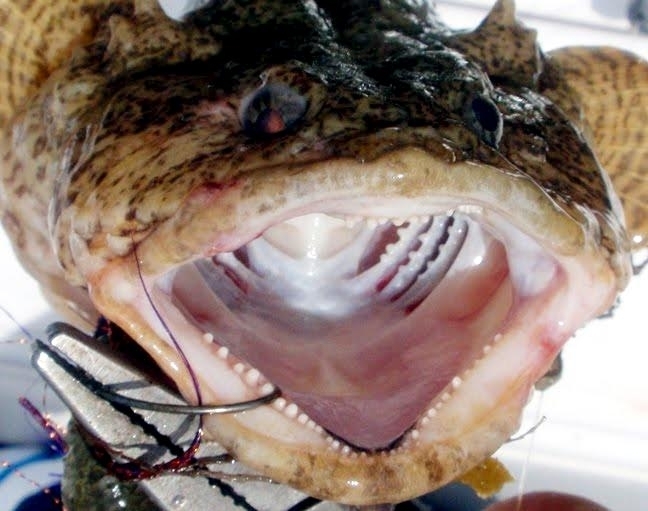 Its nose is rounded and it has a tremendous mouth with large, blunt teeth. 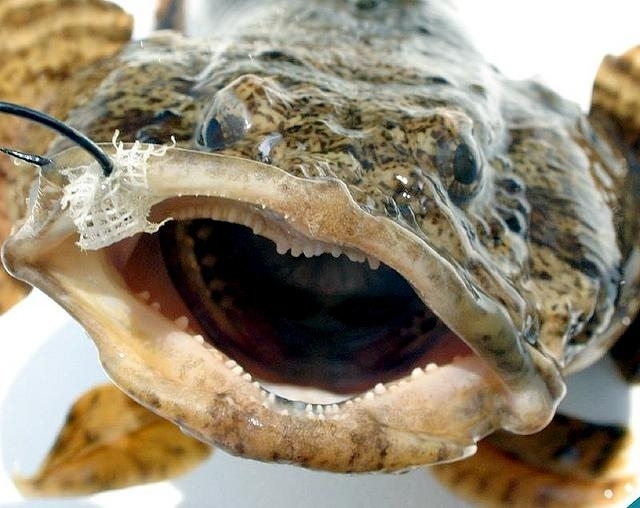 Thick fleshy flaps of skin surround its lips & eyes. 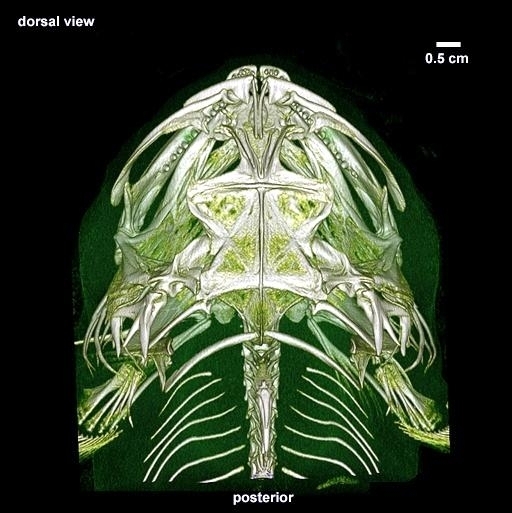 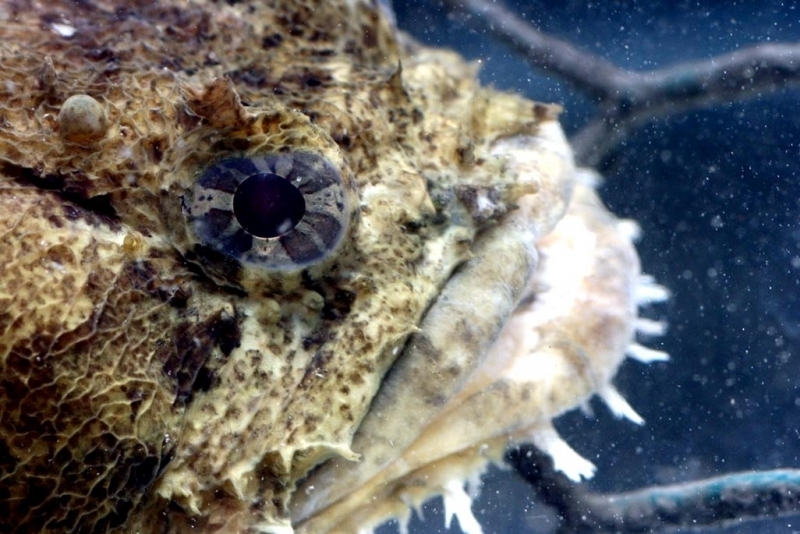 There are 2 sharp spines, located on the gill covers which the Oyster Toadfish uses for defense. 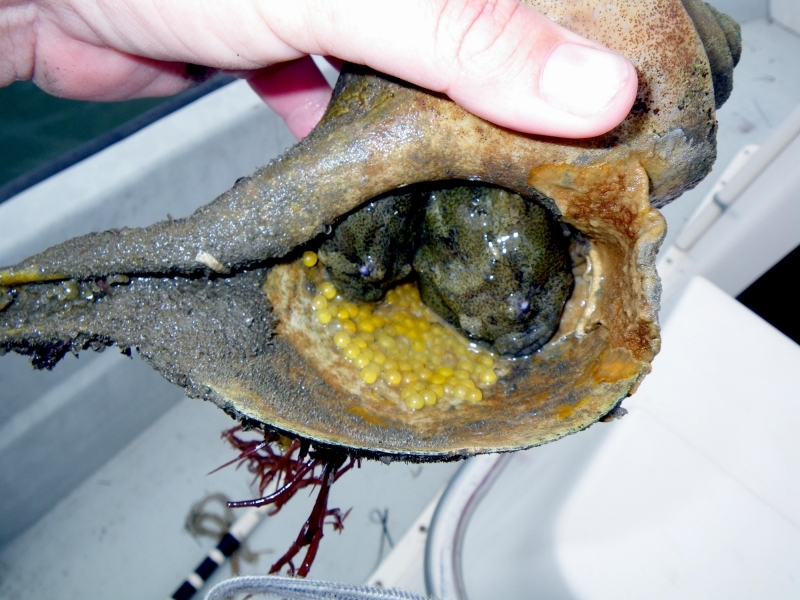 The skin is covered with a thick layer of slimy mucus. 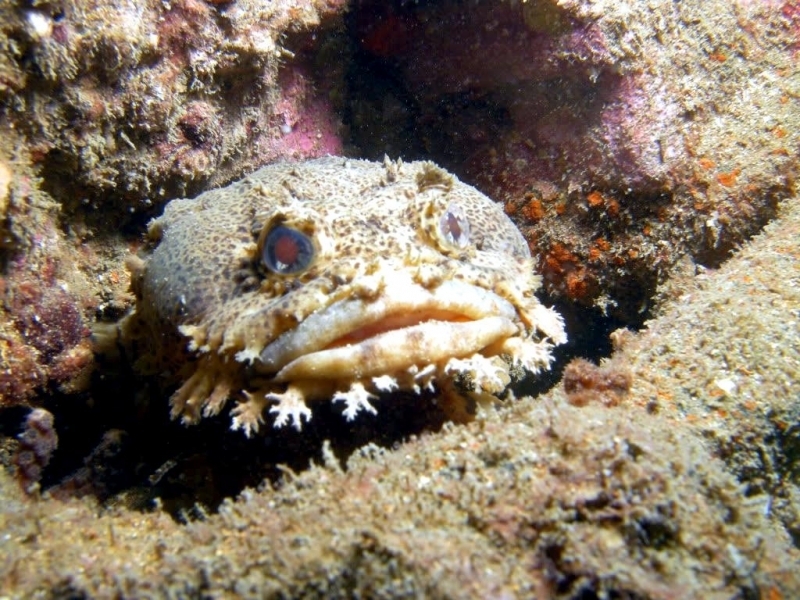 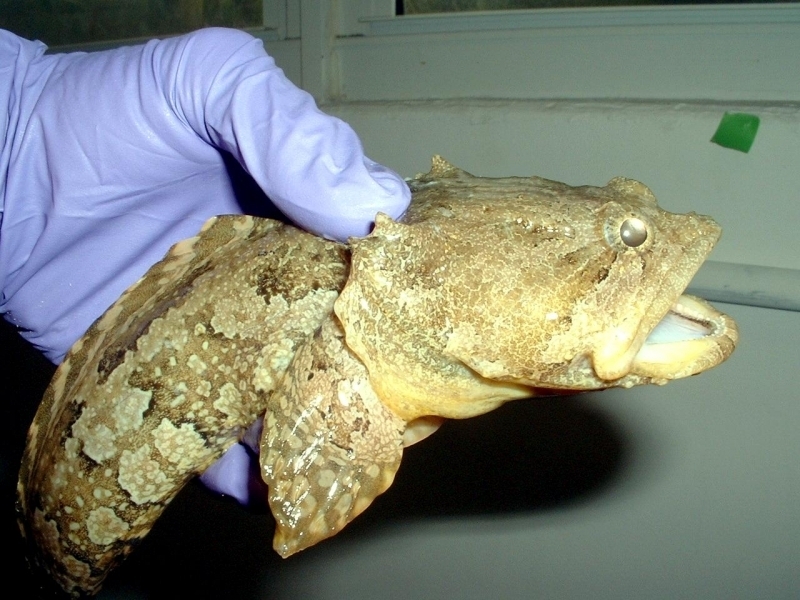 The Oyster Toadfish has no scales; its teeth are large and blunt; and it has 2 short spines at the upper angle of each gill cover, hidden however in the thick skin. 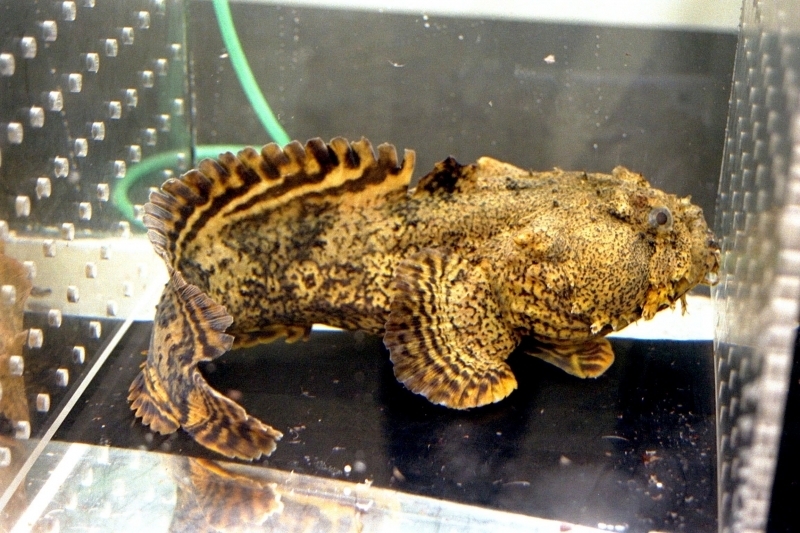 The ventral fins stretch out like fans and are located under its throat in front of the gill openings. 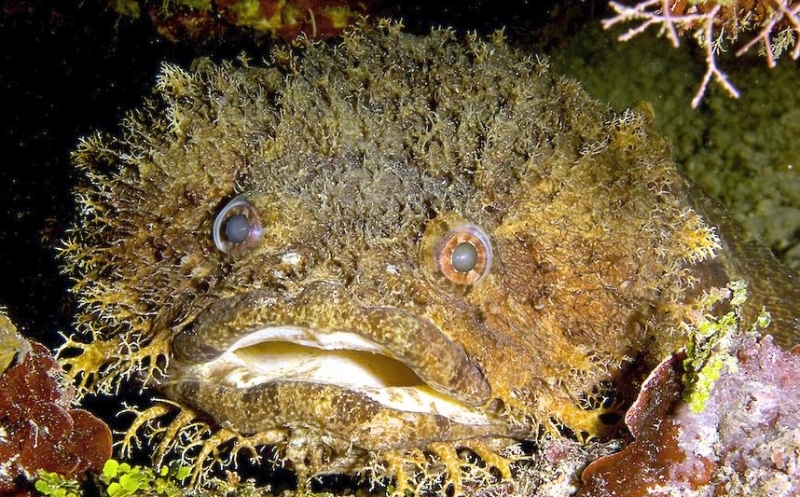 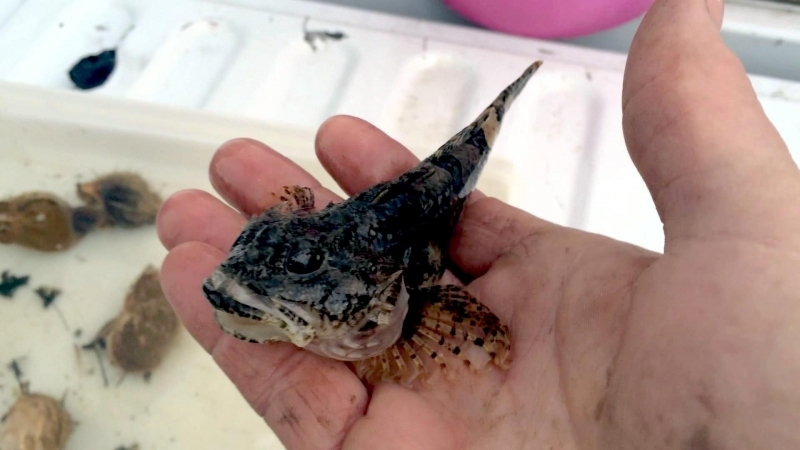 An Oyster Toadfish will quickly take an angler’s bait, but be wary of catching this fish — it has powerful, snapping jaws & sharp spines on its dorsal fin. 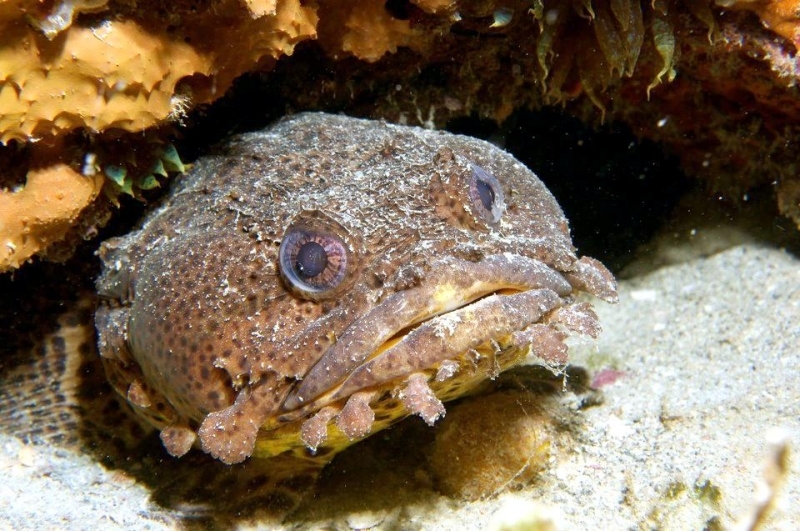 The Oyster Toadfish lives in shoal water and it is resident the year around wherever found, becoming torpid in the northern part of its winter range. 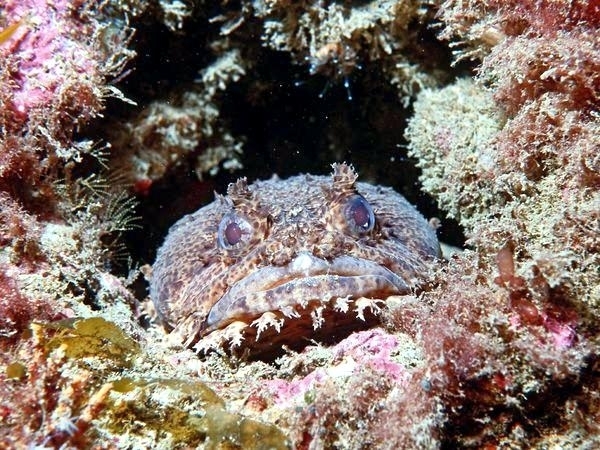 It is commonest on sandy or muddy bottom, hiding among eel grass or under stones where it hollows out dens in which it lies in wait for prey. 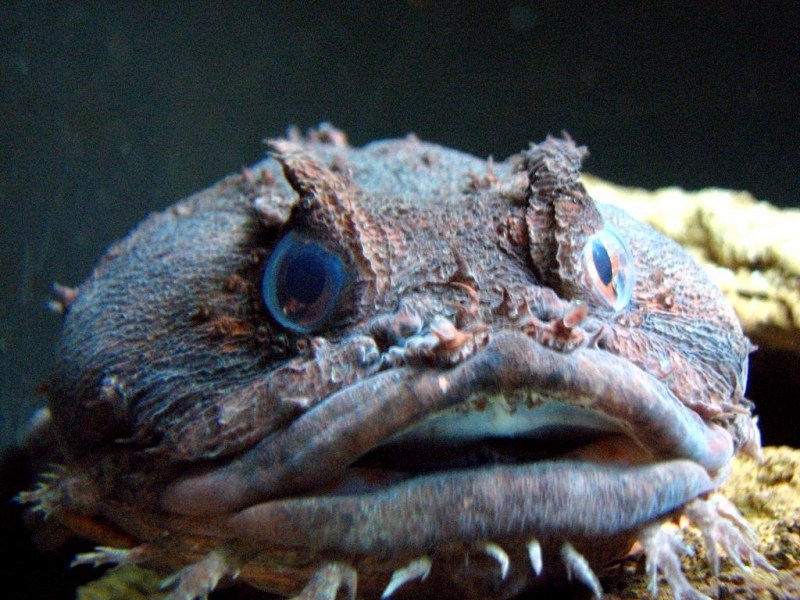 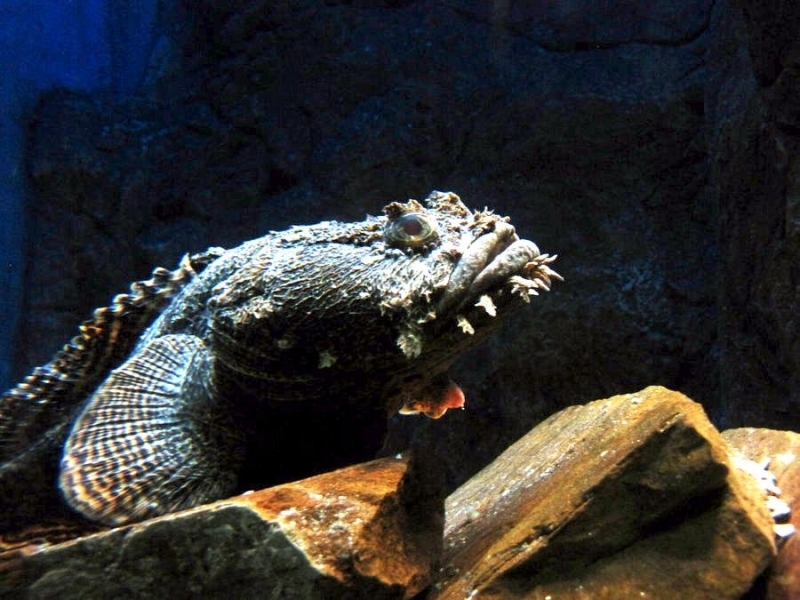 Oyster Toadfish are known to be quite vocal. 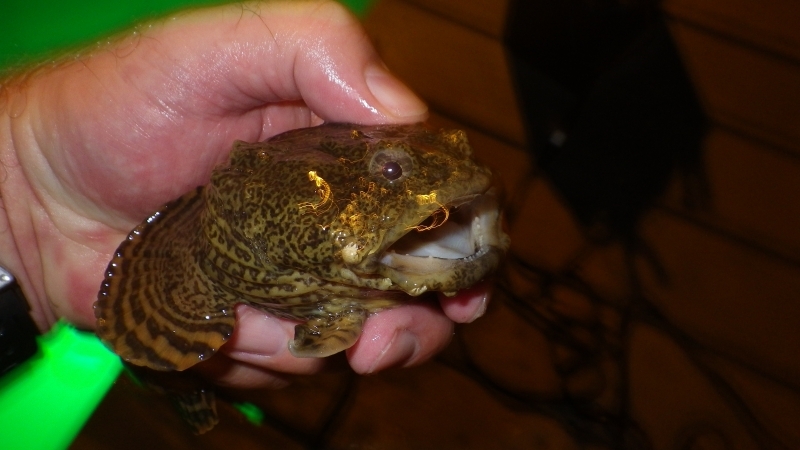 When handled out of water, Oyster Toadfish grunt. 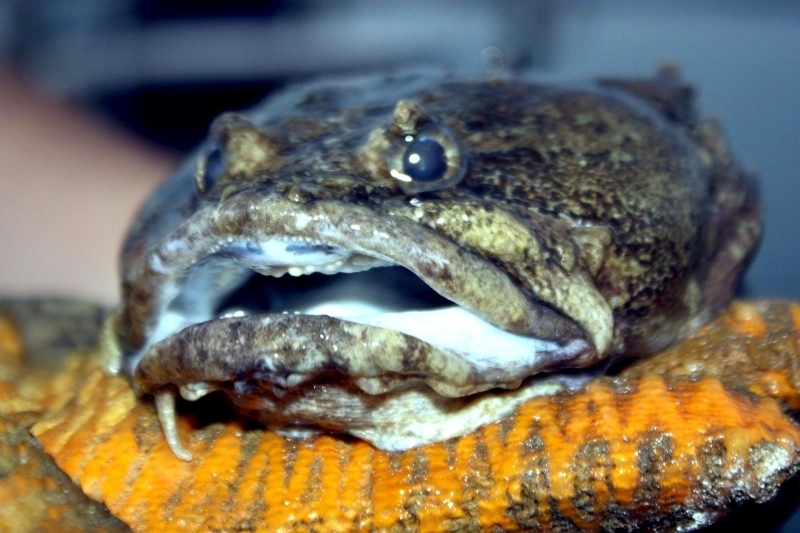 To attract a female during the spawning season, the male emits a loud foghorn-like call. 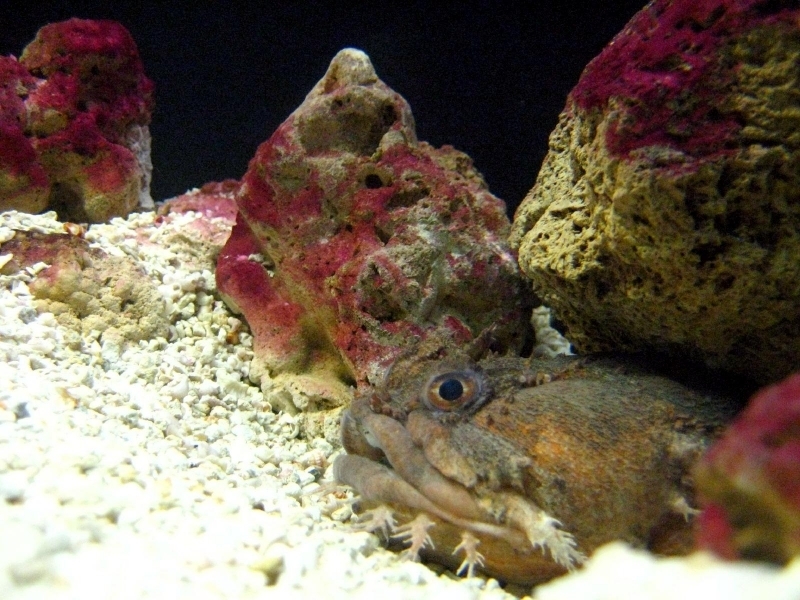 This call can be heard underwater for great distances. 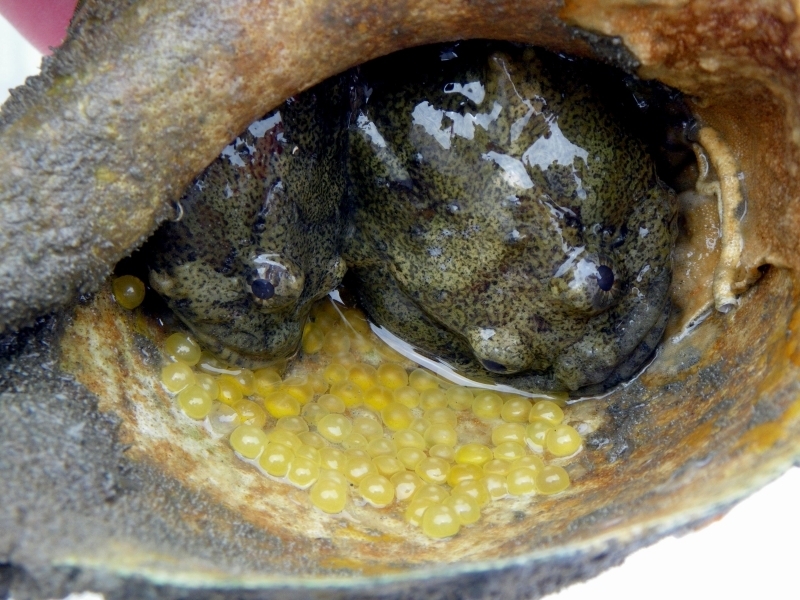 The female lays her eggs in rock crevices, under submerged wood and sometimes even in discarded tin cans. 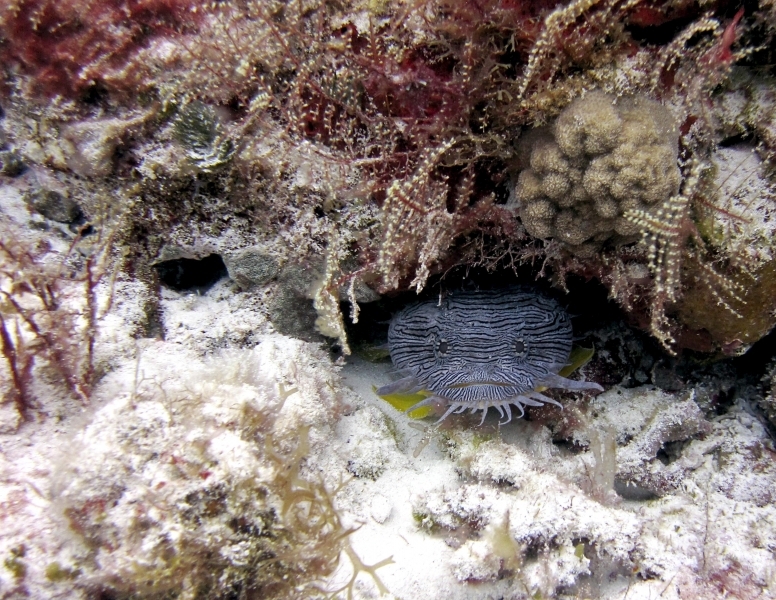 After fertilization, the female leaves the male to guard the nest. 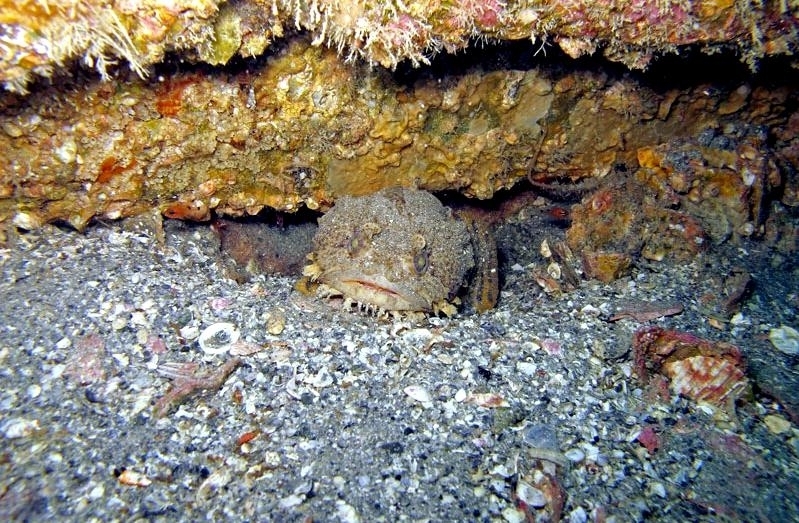 On average for a month, the male cleans the nest and uses his fins to fan the eggs until they hatch. 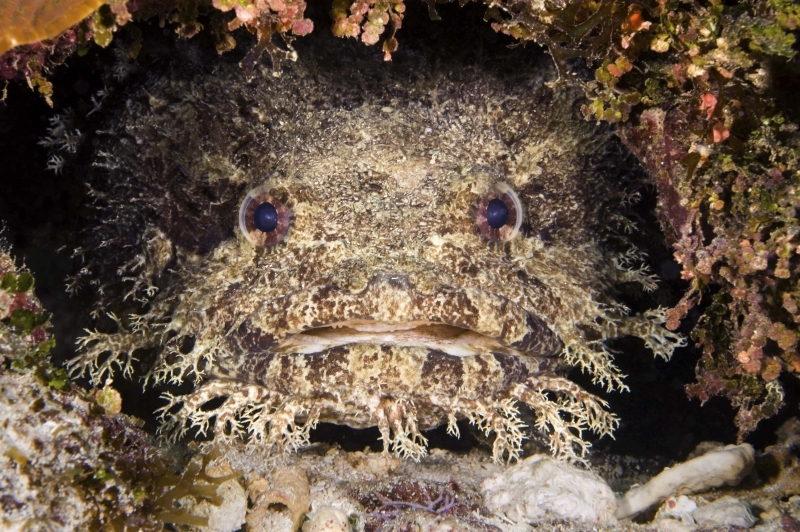 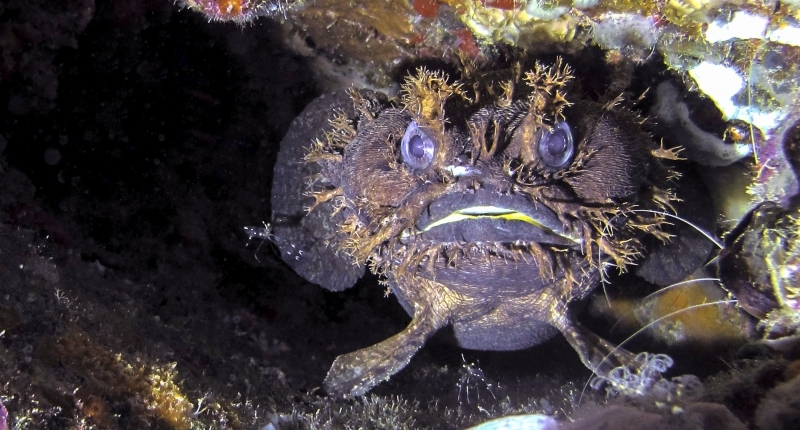 The male Oyster Toadfish continues guarding the young for 3 to 4 weeks after the eggs have hatched, keeping watch over them even after they become free-swimmers. 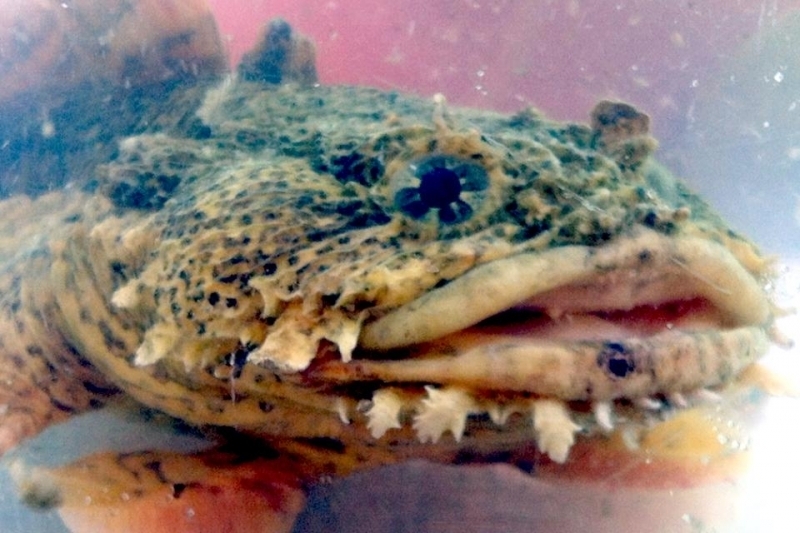 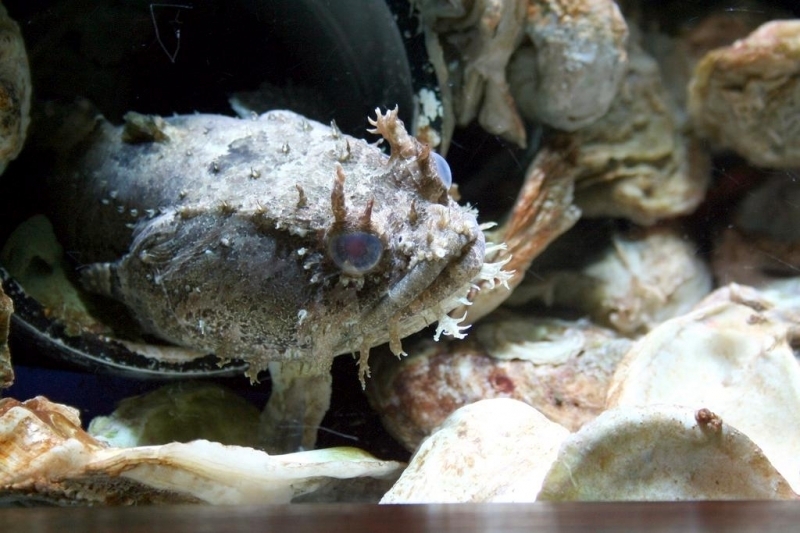 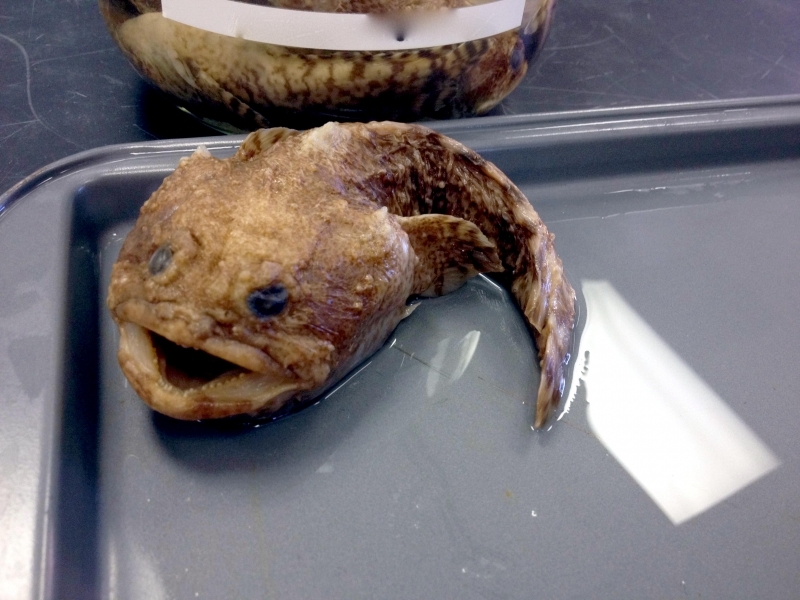 A voracious omnivore, the Oyster Toadfish feeds aggressively on oysters, worms, shrimp, amphipods, crabs, hermit crabs, mollusks, squid and small fish. 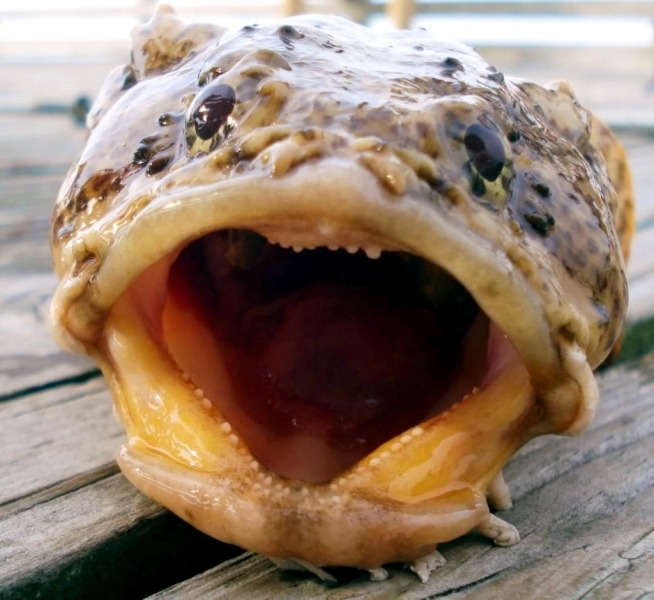 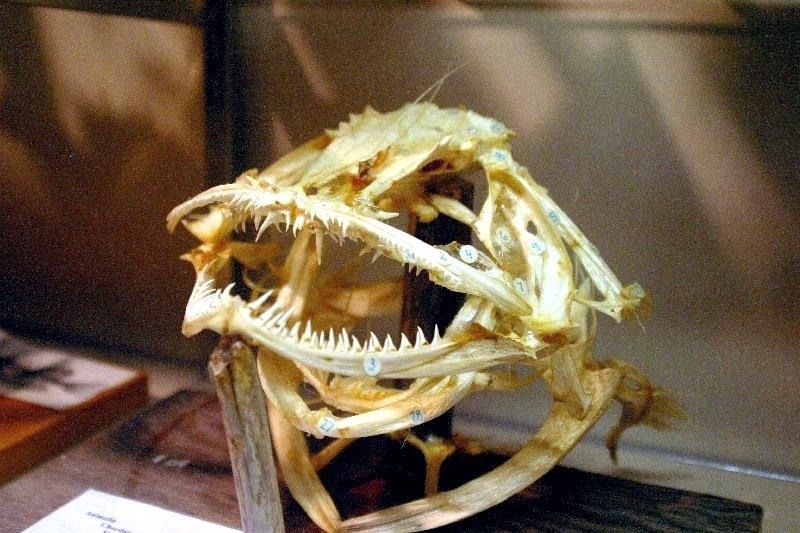 The strong teeth & jaws of the Oyster Toadfish are capable of crushing the hard shells of mollusks and are often used to fight with other Oyster Toadfish. 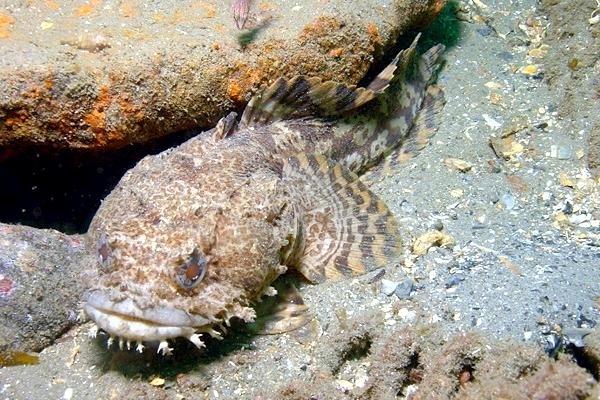 They grunt especially at night or if handled and despite their clumsy appearance, they can dart out of their hiding places and back again with considerable speed. 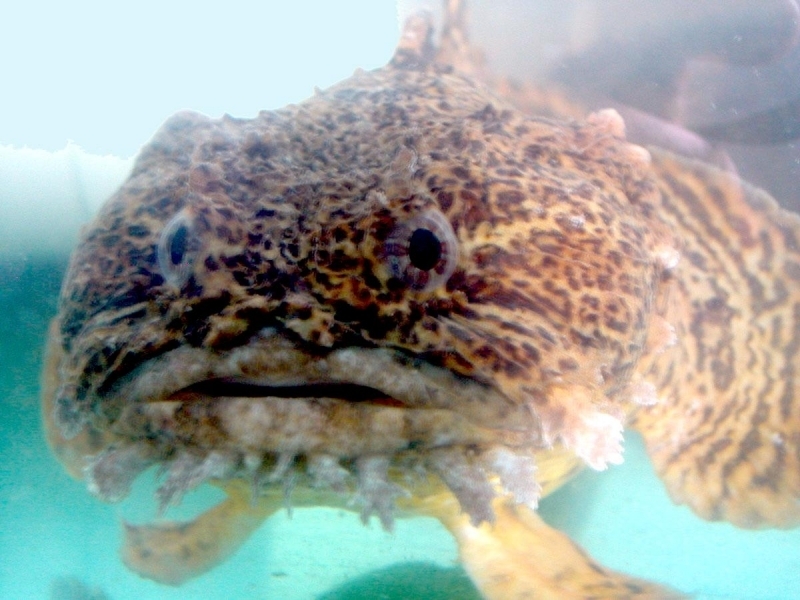 Oyster Toadfish snap viciously when caught and they often fight among themselves. 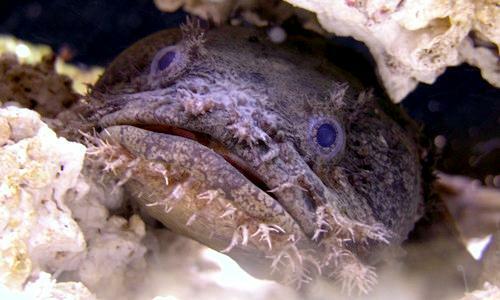 They are very tenacious of life and can live out of water for an astonishingly long time. 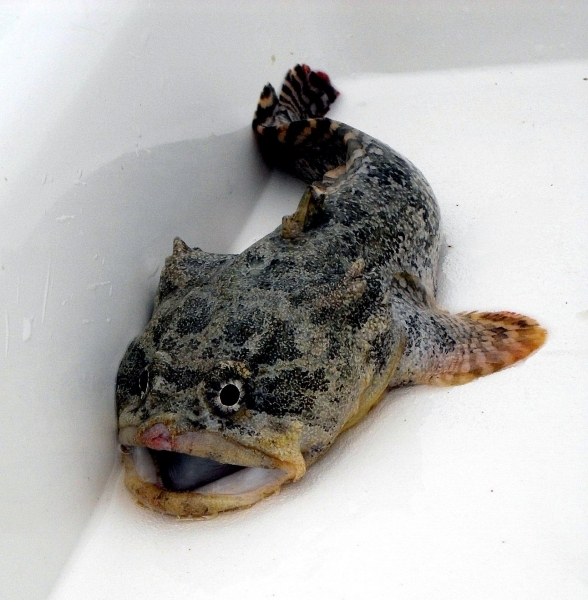 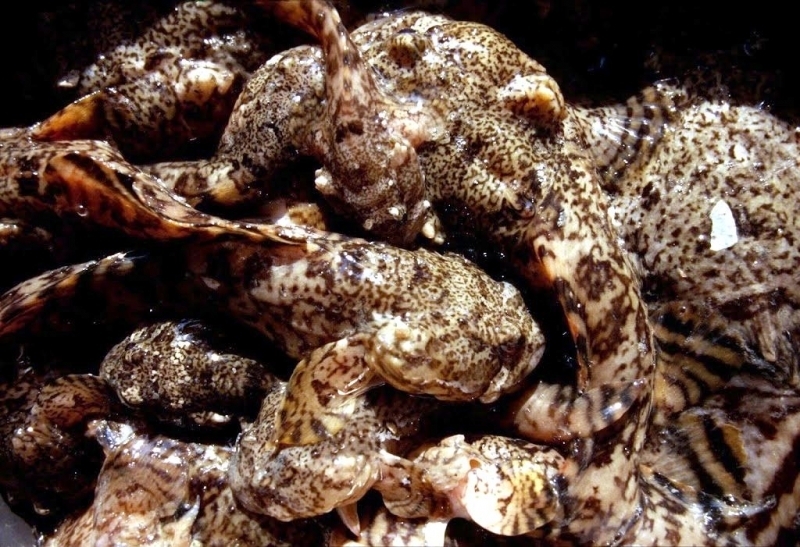 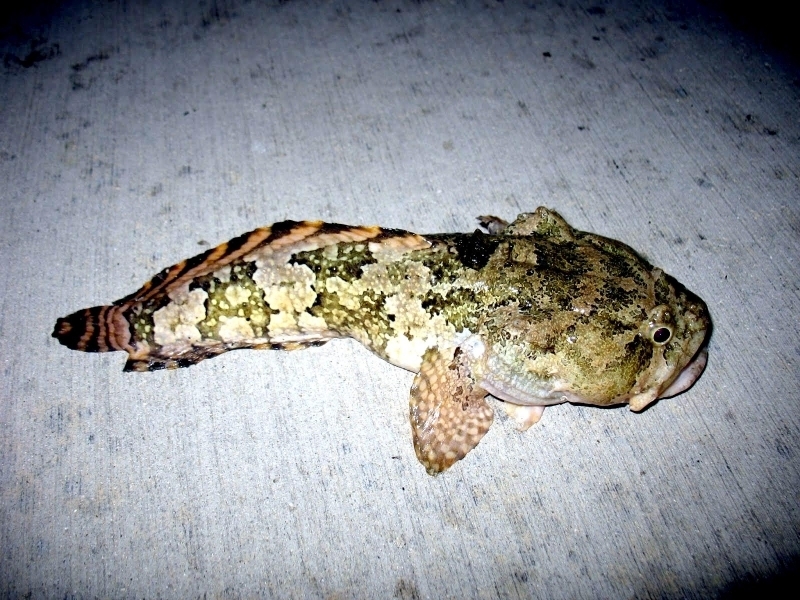 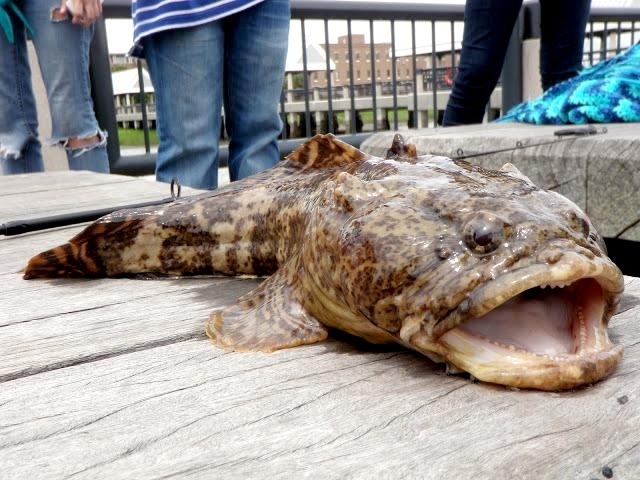 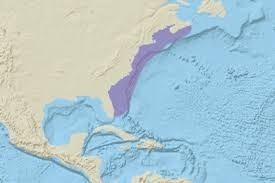 In the northern part of its range, the Oyster Toadfish spawns in June and early July. 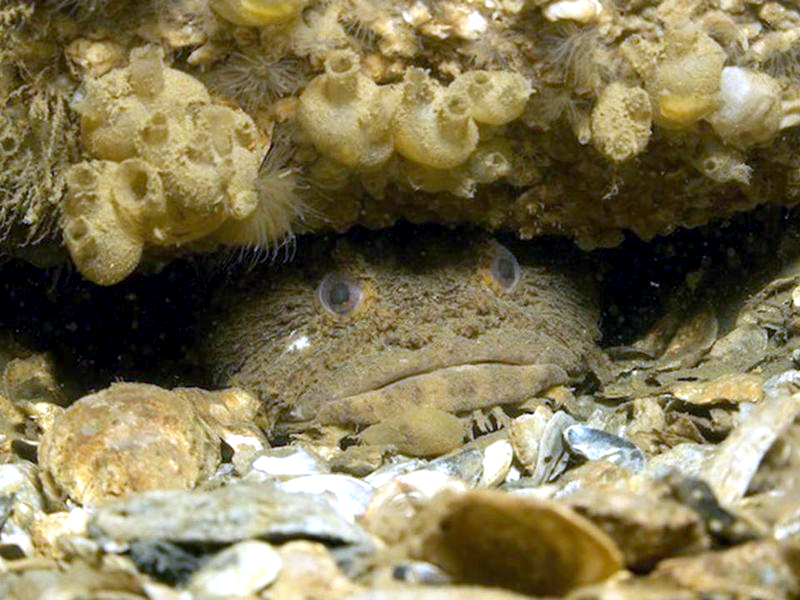 The large eggs (about 5 millimeters in diameter) are laid in holes under stones, under large shells, in old tin cans, among sunken logs or among eel grass where they adhere in a single layer to whatever serves as a nest which the male guards during the 3 weeks or so that are occupied by incubation. 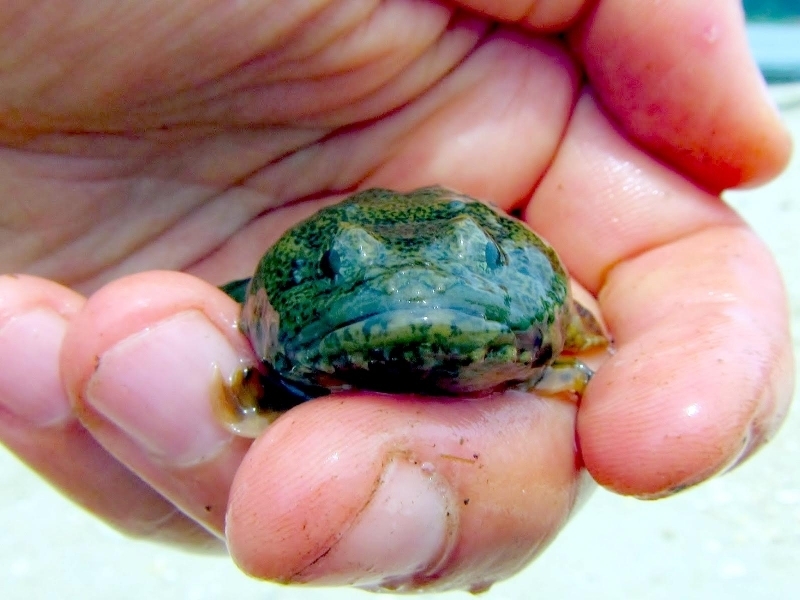 Even after hatching, the tadpole-shaped larvae remain attached to the nest by the yolk sac until the latter is absorbed at a length of 15 to 16 millimeters when they break free.